What’s the story with NK’s white on blue house number signs? The in basket: I was driving around North Kitsap recently and once again noticed the proliferation of blue signs with white numerals listing the house numbers where homes are grouped on a common driveway. There are dozens of them on Viking Way coming into Poulsbo from the south, and many more at other locations, including quite a few in Central Kitsap. I rarely see them in South Kitsap, where I live. Was the placement of those signs the result of some organized campaign, perhaps by North Kitsap firefighters? It seems like it would have taken collaboration by a lot of people, to acquire them and mount them one above the other, which seems to be the common display. “Fire Districts in Kitsap County initially recieved a grant for address signs about five years ago. Poulsbo Fire has continued offering the signs to citizens in our district, and as mentioned above, gladly accept donations to continue the program. We have promoted the signs in our annual newsletter, and at various community events. I would advise contacting your local fire department to inquire if the signs are available to you, it is a great way to clearly display your address. Greg Rogers of South Kitsap Fire says they participated in the grant and have given out many of the signs, despite my experience of not seeing them. They’re mostly in rural areas. For lack of funding, SK fire no longer provides them, he said. The in basket: When garage sales season arrives, I am often asked about the legality of signs tacked to street signs and utility poles advertising them, as well as sandwich board signs and other business signs along the road side. Some of the inquiries in recent years were about a pizza place sign on Central Valley Road, a painting company’s yellow signs along Anderson Hill Road, a junk removal company’s signs on Provost Road and apartment-for-lease signs on Ridgetop Boulevard. The out basket: Before Dusty Wiley, onetime county commissioner candidate and former sheriff’s deputy retired as Kitsap County Traffic Investigator a year of so ago, he would intermittently remove such signs around the county, especially near Manchester, where he lived. One weekend a few years ago, my wife was participating in a yard sale on Alaska Avenue near Manchester and Dusty dropped by to tell those running the ale that he’d removed their signs posted along Mile Hill Drive, and said that technically posting them could incur a $50 fine per sign. He didn’t go that far, fortunately. And my wife said even then, he’d missed signs she’s put up on Sedgwick Road. Dusty was quite ernest in dealing with such signs. His successor, Ron Pierce, says garage sale signs are most likely to be taken down if they obstruct drivers’ view of something they need to see. Jeff Shea, Kitsap County traffic engineer, says, “State law prohibits posting signs on official road signs. A-frame boards are prohibited in public rights-of-way, but are permitted in some instances under Kitsap County Code 17.445.070. “Enforcing the law and code is challenging for those involved in enforcement,” he said. “There are over 19,000 signs, and thousands of businesses, in Kitsap County. We do respond to complaints as priorities permit, and pull signs off our signs and out of public rights-of-way as part of routine maintenance operations. “As you can imagine this is not a high-priority item from a law enforcement perspective. 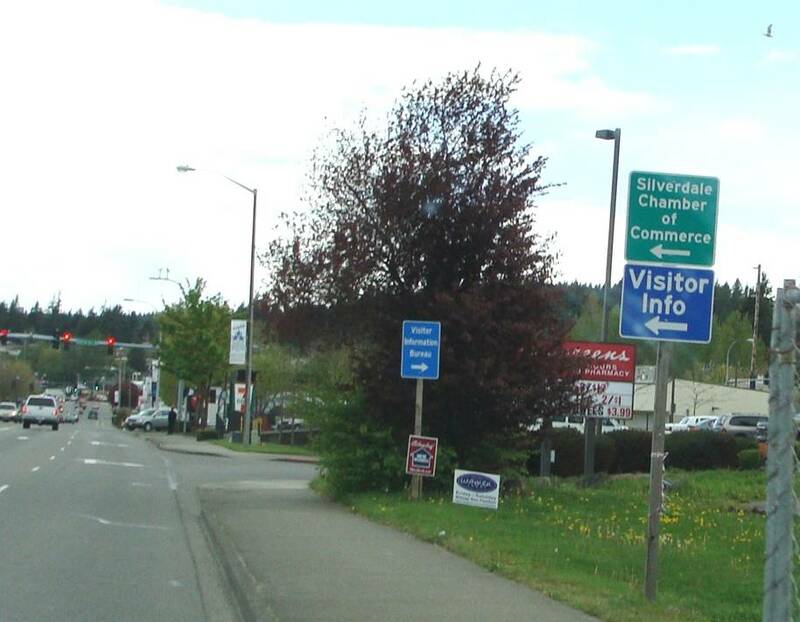 Signs that are blocking the view, blocking pedestrian access, or otherwise obstructing sight distances should be reported to Kitsap 1 at 360-337-5777 or help@kitsap1.com.